At Vehicle Wraps1, we can wrap your boat so that it stands out from the rest when you’re out riding the waves. We offer the best materials for designing wraps for boats and other watercraft so they can withstand many years out on the water. We have installed hundreds of boat wraps for many customers across the U.S. Let us help you bring your vision to reality at rates that are affordable. Each boat vinyl wrap created by our team of professional designers and installers is custom-fit for your craft, meaning that that you will have a durable, attractive outer coating that’s an exact match for your vessel. Why Choose us for Your Boat Wrap Vinyl? The Vehicle Wraps 1 team helped develop the technology of vinyl wrapping for all types of vehicles, including boats. Due to our knowledge and complete understanding of the ins and outs of both vehicle and boat graphics, we are steps ahead of others in the business. We are dedicated to offering our clients state-of-the-art boat wraps and boat graphics and are continually improving and enhancing how we design and install new boat vinyl wraps that protects the outside of your craft while grabbing the attention of everyone in and out of the water. From the rub rail to the water line and all around, our designers can create and install a custom boat wrap that covers and protects the exterior or your craft. They can even design a customized wrap or graphic that integrates the boat’s original paint and colors into your personal vision. A boat wrap proves to be an effective money saving alternative to paint. We can design and install a boat wrap for a fraction of the cost of a new paint job, and unlike paint, boat vinyl wraps can protect the exterior of your marine craft from damages like chips, scratches, cracks, and the sun. You may be surprised to know that a boat vinyl wrap cost is lower than a custom paint job craft, especially when you want graphics and other decals included. The versatility of a boat wrap is also superior to painting your boat. A Vinyl boat wrap from Vehicle Wraps 1 will hide any joints or seams on your boat giving it a truly beautiful look. When viewed, vinyl wrapped boats often give an impression of a brand new boat or a recently painted boat. Another advantage of using vinyl to decorate your boat versus paint is the fact that vinyl wraps on a boat are fade-resistant. We use superior films, including a standard 3M vinyl that is capable of lasting on your boat up to seven years. Our vinyl wraps are ideal for yachts, high speed race boats, fishing boats, sail boats and more. We know that living in Florida puts us in a place known as the boat capital of the world. Fort Lauderdale annually features the International boat show, and the coastal waters are full of boats an marine craft of all shapes and sizes. We’ve provided hundreds of boats wraps in Miami, Fort Lauderdale, Naples, West Palm beach and other areas of Florida. Our clients trust in referring us to their friends and fellow fisherman and captains, and that makes us proud. Compared to any marine paint job you’ll find that vinyl wraps for your boat are not only cost effective, but offer both convenience and protection. Contact us today; our team is ready to get your boat wrap design started! 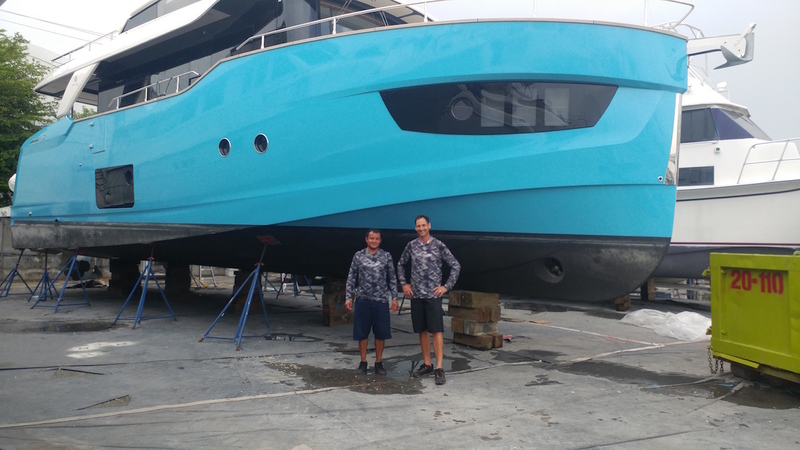 We proudly offer our boat wrapping services in many areas of Florida including Miami, Fort Lauderdale, West Palm Beach, Naples, and the Florida Keys. Feel free to visit our sister company, Marine Wraps 1, specifically dedicated to boat wrapping in Florida.